I realized I never shared pictures of the final hanging of the hoops. I love them. I was originally inspired the first time I visited Purl Patchwork and saw their swatch portraits. Only their’s are Liberty prints – and seeing as my Liberty collection is still pretty small (extremely small, like maybe one really small hoop’s worth), and that Liberty prints are around $30 a yard, I never did anything about it. Until I saw Amanda’s wonderful use of Vintage Sheets for such a purpose! Brilliant! Here’s a brief tutorial how I framed mine. I found all the hoops at thrift shops for really cheap. Most of the sheets in a likewise manner. Use the hoop to frame the sheet portion you would like to focus on. Tighten that screw-thingy. Trim off the excess leaving about an inch of fabric all the way around. 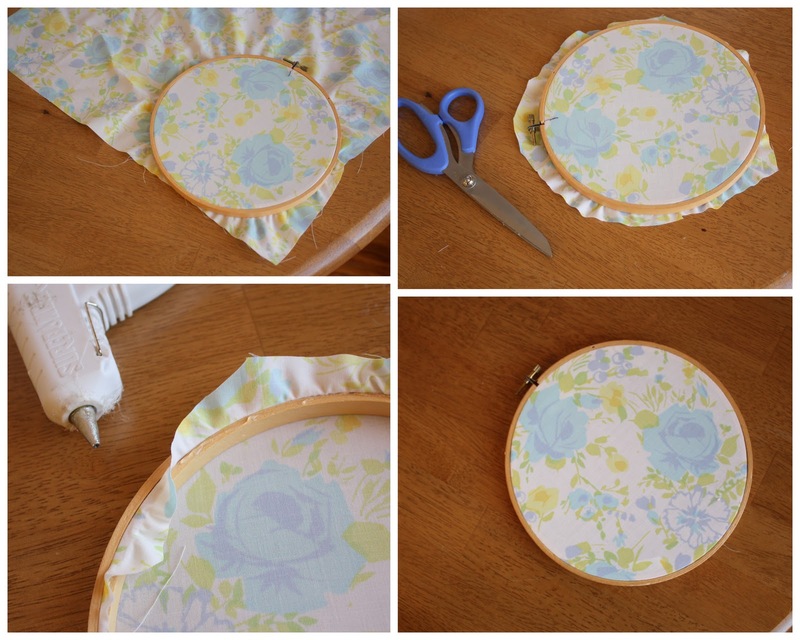 Carefully apply hot glue a couple inches at a time and then gently pull the fabric taught over the glue. This should create a nice, tightly framed swatch. I’ve hung mine over my cutting table where I can admire them. And here is a rare glimpse of my work space. (Notice the photo is strategically cropped to hide some serious piles of WIPS.) My goal this year is to have my whole sewing space aesthetically pleasing enough to be photographed. Here’s one more vintage sheet project we’ve been working on. My baby is turning 12 this week!! (CRAZY.) Anyway, she is ready for a new, chic, big-girl look to her bedroom. We found a great slightly-damaged PBteen duvet cover (at a greatly reduced price) a few months ago and we’ve been building around that. Part of that makeover includes this throw quilt made from two vintage sheets. And then we added our first coordinating throw pillow. Hopefully I can get to the curtains in the next few weeks and then we can do a big reveal. But in the mean time, here’s a bit of a peek. PS MANY THANKS for your kind words about my last post. (I realized afterwards that I had broken one of my rules about not writing blog posts when I should be in bed – that one came off way too cheezy!) But you folks are nice nonetheless. And I was reminded of this little feature. If you’ve made one of those table runners (or anything else with one of my tutorials) please share! I’d love to see it! (And so would lots of other people, I’m sure.) Go to this flickr page to post pictures. Then one day we could totally have a party showing off the stuff YOU made. This is such a pretty idea and a fabulous way to add some colourful art to the walls. What a great idea. I think I will do the same with some of my favourite fabrics. It will help to brighten my sewing space. What a great idea! That is such a cool arrangement you did with them on your wall. Great idea, and such a nice arrangement on the wall! I think the final layout is always the hardest part of hanging things up. Well done! Thanks for posting that cute throw! I just inherited LOTS of vintage sheets from my Great Grandmother, and I am so excited to put one of these together!! I might even see if there is something I can use for two new quilts in my girls&#39; room, they have a full and twin bunk, so it would be fun to coordinate two fun prints for each bed. THANK YOU FOR YOUR FUN POSTS!! I have one of those sheets. 🙂 The one you used for your daughter&#39;s throw. Its the one with purple flowers and green. So excited.<br /><br />I&#39;ve had it and a purple satin sheet to make into a TV king size blanket for 10+ years sitting in my sewing room. I may have to pull it out and finish it. LOVE THIS!! I really, really do!! Thanks for the flickr shout out! I&#39;ll be sure to post my runner when it&#39;s finished. 🙂 Happy birthday to your little girl, too. Oh, you are making me drool with your pretty hoops and your daughter&#39;s sneak peek! I have a small vintage sheet collection I had forgotten about…need to get back at it! Love those hoops! I&#39;ve been wanting to make some for a while but haven&#39;t gotten around to it. But you&#39;ve inspired me to find some fabric that I really love and just do it! I also love your &quot;baby&#39;s&quot; new quilt and matching throw pillow, a very happy birthday to her!! Nice idea love the look you achieved withe hops. The throw quilt and pillow are gorgeous what 12 year-old wouldn&#39;t love those in her room? Oh I love this 🙂 But who does not love vintage + hoops! I love your hoops! I have plenty of blank walls that could use a group of those. I love the hoops! I am sure your daughters bedroom will look divine!! I love what you did, it looks amazing!!! I really love the sheet quilt, it oh so pretty. Love the colors of her quilt and pillow! Can&#39;t wait to see the big reveal! I love this idea–I have so many vintage sheet &quot;pieces&quot; leftover from other projects, this is perfect! The sheets framed in embroidery hoops is a great idea! I may have to do that with some of my vintage table clothes that have seen better days. OMG!!!!! I have (and still use) the blue sheets with the big flowers on them as seen in your daughters &quot;new&quot; throw quilt. They are on a twin bed in our spare room. That&#39;s just too funny!!!!! hot glue gun is so smart!